"Aquatica Plus UK ships King British Aquarium Sealant 25gm from Amazon.co.uk. Amazon.co.uk has fast shipping in the UK and often free shipping on pond and aquarium supplies. Add to your basket now while supplies last to avoid delays." A one part silicone sealant. Ideal for building small domestic glass aquaria, repairing cracks and sealing connections inside or outside the tank. 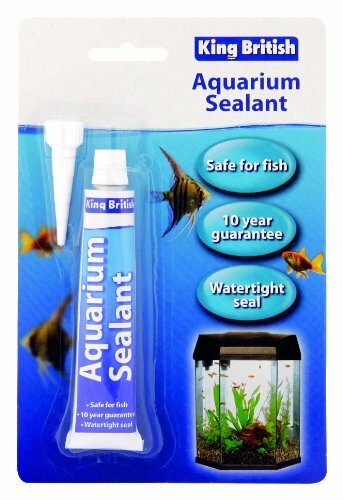 What customers say about King British Aquarium Sealant 25gm? I have used it for my aquarium that had a crack and loosing water, if you follow the instructions it will hold for ever probably. I am glad i bought it, i was about to throw away the tank. This Sealant does the job required. My problem area was near the bottom of the tank and so I had to remove the fish for 48 hours to repair the leak. I was quite apprehensive when refilling the tank but there was no need to worry as the leak was repaired. realy befor this product I bought several type but it did not work and aftere 2 or 3 day the fish tank start to recharge but this type work very well and tody is day 40 and it still very stronge with my fish tank large fracture.